The world's biggest music stars have performed at Live8 concerts around the globe aimed at persuading political leaders to tackle poverty in Africa. Concerts in 10 cities, including London, Philadelphia, Paris, Berlin, Johannesburg, Rome and Moscow played to hundreds of thousands of people. A TV audience of several hundred million watched the gigs, ahead of the G8 summit of leaders on global poverty and climate change next week. Bob Geldof said the day had been "full of hope and possibility and life". In London Madonna, U2, Coldplay, Sir Elton John and Sting all performed. Almost all of the singers involved took the opportunity to explain their reasons for performing. The Live8 concerts were intended to draw attention to the summit of G8 leaders meeting to discuss global poverty at Gleneagles in Scotland, the following week. 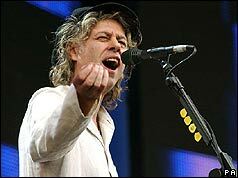 The G8 summit did agree to a $50bn aid programmed for the developing countries and Bob Geldof was quick to claim success for the "Make Poverty History" campaign. The G8 nations also agreed to cancel the debts of 18 poorest countries - while Africa continued to press for all African debts to be cancelled. On the question of climate change there was little progress with the US firmly opposed.